Creative Event Services Presents the NEW Catch The Light game which is great for all types of events! Catch the Light is a new speed and reflex game designed for adults and children. Quickly press the lit buttons to outsmart your opponent or play alone to beat your own high score. Creative Event Services Presents the NEW Catch The Light game which is great for all types of events! Catch the Light is a new speed and reflex game designed for adults and children. Quickly press the lit buttons to outsmart your opponent or play alone to beat your own high score. 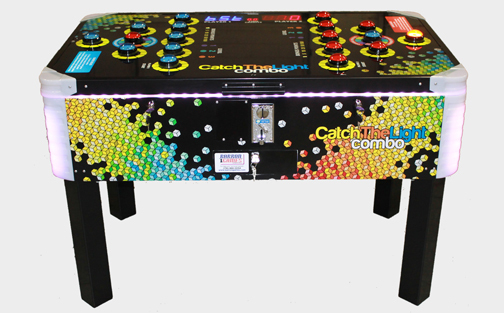 Bright flashing LED cabinet and buttons with Red and Blue displays for Scores, Credits, and Time counter. Beautiful Graphics with LED Backlights and Illuminated Corner Covers!